The music played in the treatment room, spa or clinic can help to create the perfect soundtrack for a massage or reflexology session. The wrong music can be distracting and irritating for the client. In a large spa environment, the therapist may have no choice in the music played as it may be piped into every room. 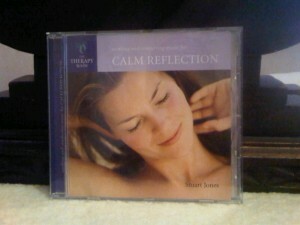 In a smaller spa or clinic there may be an ipod or cd player in the room for the therapist to select the music played. Music choice is a matter of personal preference. I tend not like the sounds of nature, although it is fine outside when you are at one with nature. A cd with the sounds of running streams and tweeting birds is a no no for me. I am also not a fan of pan pipes or Enya. Classical music can work as long as it is a calm and even tempo. There are some classical songs which have varying highs and lows in volume and can sound quite dramatic so it is not the best choice when trying to create a relaxing environment. In my treatment room I keep the volume of the music low so it can be heard but not too loudly to be a distraction during the session. I can generally tune the music out as I work and will only notice when it stops or gets stuck. I am quite happy to work without music if the client requests this. I wanted to share with you some of the music that I play when giving a massage or reflexology treatment. This cd was a freebie with a Rosemary Conley diet and fitness magazine that I bought about 8 years ago. 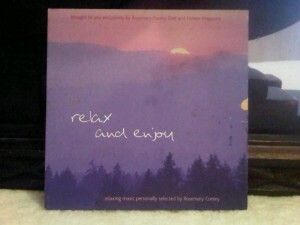 It is called Relax and Enjoy; Relaxing music personally selected by Rosemary Conley. The majority of the songs are by Ben Parkinson who is a composer and keyboard player. He has written many tracks that Rosemary uses for her fitness dvds. The song titles on this cd include Unwind, Above The Clouds and Pictures. The music is instrumental piano compositions. It is calming and relaxing, creating the perfect musical backdrop for my treatments. This is my most recent cd purchase. It is called Calm Reflection and is part of The Therapy Room Series. I listened to some of the other cds in the series but this was the one that resonated with me. It is instrumental piano music and each track blends nicely together. The tracks include Total Freedom, and Calm Reflection. Recently instead of putting the whole cd on repeat, I accidentally had only the first track on repeat. I didn’t realise my mistake until 50 minutes into a 60 minute massage. I don’t think that my client realised either. For my Chavutti Thirumal massage treatments which is also called Indian Rope Massage or Massage by Foot Pressure, I use either of these two Indian music cds. 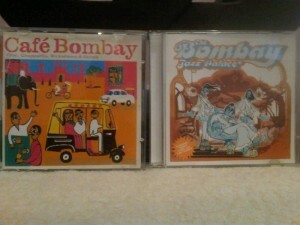 One is called Cafe Bombay and the other Bombay Jazz Palace. Some of the tracks are instrumental and others have vocals. The instruments used include drums, guitars and sitar. I feel that using Indian music adds authenticity to the session. If I was able to be totally self indulgent in terms of the music I played in my treatment room, these two cds would be at the top of my list. First is Gregory Porter’s “Be Good” cd from 2012 which is my favourite cd at the moment. Gregory Porter is an American jazz vocalist who has a deep, smooth and comforting voice. His storyteling in his songs creates a picture in your mind. 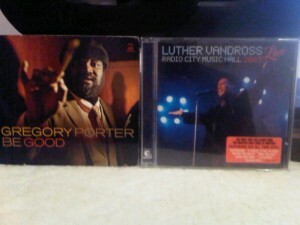 The second is Luther Vandross, “Radio City Music Hall 2003 Live” album. Luther Vandross is one of my all time favourite singers who sadly passed away in 2005. Listening to this album takes me back to the times when I was lucky enough to see him in concert.